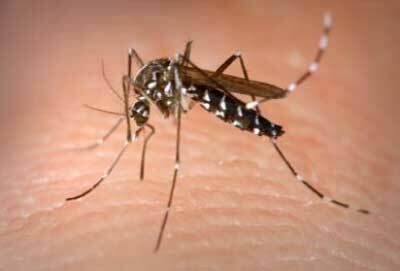 Living here in Houston, where the summer time weather is always hot and humid, I've come to realize that I'm living in paradise...a mosquito's paradise! It doesn't matter what time of the day or night my family and I are outside, someone's always getting bitten. To make matters worse, both my husband and my daughter are allergic to mosquito bites and get these large, itchy whelps on their skin once bitten. Mosquitoes also seem to be attracted to the both of them, for no matter where they are in the backyard, they end up with bites when I rarely seem to get them. ThermaCELL, one of the leaders in mosquito repellent technology, allowed my family to review the Cordless Portable Mosquito Repellent Appliance this summer. So were we finally able to enjoy our backyard without ending up as mosquito lunch? Keep reading to learn more! I always felt so sorry for my husband while he was out mowing the yard or trimming the hedges, for he would soon come back inside itching from head to toe. Mosquitoes have always been drawn to him and when they bite, they leave behind a large, itchy whelp which is bothersome for days. So of course, I was thrilled to have the chance to review the ThermaCELL Cordless Portable Mosquito Repellent Appliance, for now Michael could clip this onto his pants for a layer of mosquito protection wherever he went. Not only will the ThermaCELL Cordless Portable Mosquito Repellent Appliance protect him from 98% of mosquitoes, black flies and no-see-ums, it will also protect anyone within a 15 square foot area of this device. From now on, there's no way that my family will go anywhere outside without making sure to bring along the ThermaCELL mosquito repelling device. It's so very lightweight, compact and convenient and contains absolutely no DEET or use of open flames. The ThermaCELL Portable Mosquito Repellent Appliance is definitely a healthier alternative to those harmful chemical repellents you must apply directly to the skin. This appliance uses the heat from a butane cartridge (included) to heat an insect repellent mat (included). Each butane cartridge will last 12 hours and each insect repellent mat lasts 4 hours. When you purchase a ThermaCELL Cordless Portable Mosquito Repellent Appliance, you are given enough supplies for 12 hours of pesky bug protection and additional cartridges and repellent mats are able to be purchased separately. 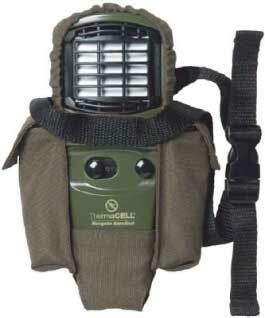 The ThermaCELL Holster with Clip was extremely useful with the Portable Mosquito Repellent Appliance. It fits all full-size ThermaCELL and ThermaSCENT appliances and has a rotating 360 degree clip so that it's super easy to attach to almost anything, including belts, backpacks, fences, branches, tree-stands or lawn chairs. There are even two side pouches which are useful for storing extra butane cartridges or insect repellent mats. With the ThermaCELL Holster with Clip, it was super easy for my husband to clip the unit directly to his person while out working in the yard. Finally, the All-Purpose Swivel Light was another well-designed accessory for use with the mosquito repellent appliance. Simply clip the light onto the top of the ThermaCELL appliance, your belt or hat for an instant hands-free light source. The 8 LED lights can provide either white or green light and have a beam distance of over 15 feet. 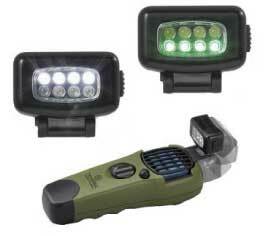 This swivel light is extremely lightweight and even has a battery life of up to 30 hours. Because the swivel light doesn't have to accompany the mosquito repellent appliance, I highly recommend this for use while camping, hunting, fishing, automotive or home repair, both indoors and out. If you live an area of the country where mosquitoes, black flies or no-see-ums are a plague on your summer time recreation, then I highly recommend the ThermaCELL Cordless Portable Mosquito Repellent Appliance and available accessories. These items greatly reduced the amount of bug bites my family received while outside and have made our backyard the fun family hangout that it used to be. Take back your own backyard with ThermaCELL! Disclosure: I received the above mentioned items from ThermaCELL in order to facilitate my review. No other compensation was received. This product review is based on my own personal experiences with this item and is completely honest and objective.